← Umpleby’s eGift Cards are now available! 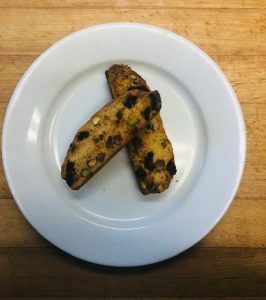 Growing up, biscotti weren’t in the repertoire of Christmas cookies that my family would make. I suspect that simply has to do with the fact that we don’t have any Italian heritage in our family tree. That changed when I moved to NYC and worked as a pastry cook. I learned from working at two restaurants that made them – Osteria del Circo and Gramercy Tavern. A twice baked cookie – if you are looking for flavor and crunch this is for you.